Canine lungworm (Angiostrongylus vasorum) has long been recognised as a problem in south Wales and the Southwest of England for many years. In recent years there have started to be reports of cases further north and it is a particular risk if your dog enjoys eating slugs and snails! 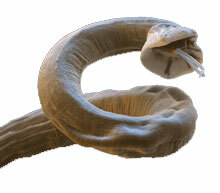 Adult "lungworms" live in the heart and the blood vessels of the lungs. The adult worms lay eggs that get trapped in the small blood vessels of the alveoli (air-sacs) in the lungs, where they hatch and the L1 larvae break through into the alveoli. They then migrate up the airways and are coughed up and swallowed into the gut. Larvae in the dog's faeces are then ingested by slugs and snails where they develop into L3 larvae; if the infected mollusc is eaten by a dog, these larvae are released by digestion into the small intestine where they burrow into the local lymph nodes, develop into L5 larvae which migrate to the lungs to start the cycle all over again. The adult lungworms can cause disease in two ways; firstly by clogging up the blood vessels in the lungs, and secondly, by causing an increased risk of spontaneous hemorrhage/bleeding in other tissues, most seriously the spinal cord or brain. Symptoms of bleeding in the spinal cord or brain include "stroke"-like symptoms; also typically there can be bleeding into the whites of the eyes both sides. Diagnosis depends on blood tests and/or direct examination of the animal's faeces to see if any larvae can be found. Blood clotting times are prolonged. More advanced diagnosis may include MRI scans of the spine/brain which reveals hemorrhages, a spinal tap would yield bloody fluid and a chest Xray may show some evidence of the damage in the lungs and their vessels. Treatment involves killing the worms with a suitable drug, supportive treatment to help blood clotting (usually involving transfusion of blood products), rest and time. Although these cases are still rare, the haemorrhages are usually very serious and relapses are common. It is entirely preventable and there are two licensed products which address this problem; the first is a Prescription Only product called Advocate (a "spot-on" preparation administered monthly) and the second is our normal prescription-only wormer, Milbemax, which will be effective if given monthly. Please ask us at the surgery for more details if you are worried about this problem, especially if your dog is a habitual mollusc eater. Just a thought, would French dogs be more at risk?